Re: Welcome To A Different Way Of Trading - Trading With Confidence! Let me tell you something I hate, and then I'll tell you something I love. I HATE seeing good people lose money in the stock market. Nobody likes losing money. I've been there and done that. Perhaps that's why I have compassion for the millions of people who are currently losing so much of their financial worth. People are losing their stock portfolios, losing their 401k's, losing their jobs due to the sour economy, and just generally getting spanked by Wall Street. "With My System You Can Make Money from the Stock Market During the Recession... No Matter How Bad the Economy Gets!" Unfortunately, I can't help the "masses" avoid financial loss. It's just a part of how the game is played. Someone is always going to lose money. In other words, someone is always going to lose money, but that "someone" DOESN'T have to be you! And what do I love? I LOVE empowering people to achieve success in their lives. So I guess that this love and hate are what motivated me to create the Trading Pro System for you. You will NOT find this system being taught by ANYONE else, and it absolutely has the potential to drastically change your life for the better! However, I'm NOT going to feed you a bunch of "get rich quick" hype, because that's not what the course is about, nor is it my style. This Has Been 20 YEARS In The Making! First, I want you to know that this program was NOT just conceived in the last few weeks and packaged as a product to sell. This course is the result and culmination of 20 years of thinking, planning, learning and practicing the material that you will receive. You Will Trade With Confidence! I will tell you right now... my trading system is NOT gambling! I treat trading as a real business. In fact, I don't even consider myself to be an 'investor' or 'speculator' or 'trader' in the traditional sense. The truth is, and this is exactly how I see myself: I am an entrepreneur. As an entrepreneur I seek opportunities in the market as well as engage in buying and selling activities to generate the highest return on my investment and then simply manage my risk. My product is options and stocks. I buy and sell them to make money. All businesses buy and sell to make money - I just do it with stocks and options. All good businesses manage based on numbers and ratios - I do the same thing - I manage by the numbers! All businesses plan for profits and create opportunities for the largest return on investment (ROI) possible - I do too, except I create opportunities for the largest return on margin (ROM). I know exactly what my maximum profits are going to be before I place a trade. I don't guess or speculate - I have a plan. Then I simply manage the position and, if necessary, adjust my positions to remain profitable or cut my losses through smart risk management technics and collect my profits at the end of the trading cycle (monthly). my system will always work! This business will never change... the principles, once you learn them, are yours forever. You could learn these and hand them down to your children and grandchildren. The basics of this business will never change because the underlying the principles will never change. That's why I call it an 'evergreen' business. Unlike franchises or other types of consumer or business-to-business markets, the stock and option markets have been around for hundreds of years. And even though the markets move and change in some ways, the principles have been the same for the past 200+ years. How did I discover how to start a stock and option business? One day I woke up one day to find a little extra cash sitting in a money market earning 1.5% a year. The next year it was earning 3%... wow - 3% a year. I felt my money should be put to better and more productive use and I started looking into all kinds of franchise opportunities and other businesses to invest in... but they all had one drawback - the financial investment was large but so was the investment of time... something I really didn't have as a father of four. So after years of 'hit or miss' trading I started thinking about trading as a real business about 2 1/2 years ago - buying and selling stocks and options as a 'business'. I didn't know if it could be done, but the idea intrigued me. I knew somebody, somewhere was making a killing in the markets and I was determined to find them, learn everything they know and make a killing of my own. I was determined to run my trading as a business, not as a gambler, and that meant looking at opportunities, supply and demand, marketplace dynamics and managing my business based on solid business fundamentals: profit, loss, expenses, overhead and return on investment. Like any business my only concern was to buy something that I could sell at a profit - and with enough of a profit margin so that my expenses (although small) were covered leaving me with a consistent and reliable income. The business of trading has all of these advantages. can be managed in 15 minutes a day. It has all the makings of the 'perfect' business! The problem with creating a business based on the markets is that it seems like they are consistently changing and there is a lot of risk! As you know, the markets go up one day and down the next! I was really confused which way the market would turn, and since I hated the idea of losing money I tried to "predict" the market's direction because that's how I THOUGHT money was made. I got really, really good at 'technical analysis'... I THOUGHT that it held the key to profits... if I could tell where the market was headed it would be easy to make money, right? I learned all about waves and candle sticks, MACD, ADX, CCI, Bollinger Bands and Fibonacci and hundreds of chart 'patterns'... and I thought I 'knew' something' about the future of the market! Frankly, technical indicators are like crutches - they only help to support and validate your trading ideas already formed in your mind. They do not help you become a better trader or see the reality of the market. There are only 3 technical indicators you need to run this business: support, resistance and trend lines. That's' it. We keep it simple. Simple makes me money. market they only manage risk. Most of the elite traders don't care if the market goes up or down - they make money either way. They use charts sparingly. 1) All stocks fluctuate in price. The top traders learn to respect these rules because they are the ONLY truths of the market. Everything you hear about the market outside these 2 rules is hearsay, opinion, commentary and even complete fantasy. Of course you will never hear anyone on CNBC even mention these 2 rules because they would have nothing to report! Can you imagine Maria Bartiromo saying, "Prices fluctuated today. Have a nice evening everyone! I'm outta here!" So the top traders respect these rules because they are so powerful and it helps them cut through the 'market noise'. Then they design their trading business around these rules to TAKE ADVANTAGE of them. Once they see an opportunity they jump on it and simply manage their business 'by the numbers' and, for me it takes 15 minutes - sometimes less - a day. How much can you make? Frankly, it depends on your capital, ability to learn, and your ability to maintain your discipline in this business. Don't be concerned about how much you have to start your investment business (even though I had a considerable amount of money I could invest, I started mine with a small amount so I could learn this business). Just learn the skills and reinvest your profits - they will grow quickly. If you've lost money in the market it can destroy your confidence. My system will allow you to trade with 100% confidence again because instead of hoping to make a profit by guessing what to do, you'll have a plan. Remember what I said at the top of this letter... this is not about hype. I will never guarantee you will make money with this business because I can't tell how you'll use the information that I'm going share with you. Your success in your investment business depends on only one thing: The decisions YOU make. The only way for you to make the right decisions is by having superior knowledge. Once you understand how to REALLY make money, you will trade with total confidence! That's what I can do for you and I do not say it lightly, it's true! Also, I cannot give you official investment advice because I am not an investment adviser registered with the SEC and I am not a CFP (certified financial planner), so if you watch the videos and you see me trading a certain ETF or stock please do not interpret it as a recommendation. I can show you exactly what I do, and how I do it. I'll teach you virtually everything I know about this business; but the actual decisions you make with your money is up to only one person: You. There is no one who will tell you what I will share with you. No one. You could pay $5,000 or more to attend the top trading seminars, and you still won't learn what I'm going to teach you! I went to a $5,000 'high level', 'super advanced' seminar last year put on by a 25 year veteran - a former floor trader and market maker in options on the CBOE. I went to another 2 years ago that costs $3,000 and I got one tip from it - how to tell if a stock is in a "channel"... no kidding, that was it! 3,000 dollars! What I'm going to teach you will blow away anything that I learned in any of these seminars. I'm not kidding. In fact, I'd say, in truth, they were almost a waste of my money. I say 'almost' because they did help a little but they lacked practical application of the knowledge they presented - it was mostly theory that left the attendee no better off, in practical terms, than they were when they started. It really works and very few people (even professionals) teach anyone how to do this. I know this for a fact because I've talked to some of the pros, and either they don't know this system, or else they are not willing to admit it. But there are a few guys who really know this stuff inside and out (one guy is sort of teaching this and the others are not teaching it at all). I found them and picked their brain over and over until I figured it out and came up with a system based on what they told me. Most of them didn't even know how to explain what they do-- it's like instinct to them and they couldn't express what they did in a step-by-step coherent way, so I really had pull it out of them. Then I put together what I learned, and came up with a complete business system that anyone can follow. I'll just say that I think it will surprise you how profitable and easy it is to run - and just 15 minutes a day is all you need. On the other hand, if you want to make this a full-time business - you can! There are plenty of opportunities to make even more money if you have more time to devote to this business. Have you been in the market as an investor and been disappointed with the results? Do you stay away from the markets because you think they are too risky? Are you confused by technical and fundamental analysis? Would you like to stop GUESSING which direction the markets are going, and take the professional approach to trading as a business? Does the idea of managing your business 'by the numbers' make sense to you? Does the idea of trading stocks and options as a real business sound good to you? If you answered 'YES' to any ONE or more of the questions above, I think you would be a good candidate for this training. There are a total of 41 videos within the course. The videos are grouped into several "Modules", with each Module containing 'hands-on' videos walking you through the entire system! We use videos because you can SEE exactly what to do as you learn, and you can watch them over and over again (if necessary) to review and build your understanding. Totaling Over 24 HOURS Of Me Teaching! The videos and modules are very well organized in an easy-to-navigate membership area, and they are sequenced in a perfectly logical order so that you can easily learn the system one step at a time. You can watch these videos directly on your computer... you will have access to them anytime of the day or night - whenever it's convenient for your schedule. The course will be delivered to you 100% online. This Module is designed to introduce you to a new way to trade stocks and options - as a business. Emphasis is on risk management and building a portfolio of trades that can be managed 'by the numbers'. Learning the craft, acquiring the skills required to be successful in this business. This Module contains over 2 hours of great teaching! The 'greeks' play a critical role in your trading business. I totally de-mystify them and tell you exactly what the greeks are and, in practical, easy to understand language demonstrate how they impact your business. The greeks are the numbers you need to understand to manage your portfolio profitably. Special report included! I'm also including the most comprehensive, yet easy to read 5 page CONFIDENTIAL REPORT on how to profit from "The Greeks" available in the world (yes, the world, and no, I'm not kidding). We've set the stage, now it's time to get on with the work at hand. This is where things get good and interesting. What positions do we take? How do we determine when and how? Do 'charts' matter? What is the big picture behind what we're doing? Build a portfolio by putting on positions that work together. This is where many traders go wrong - they put on individual positions and do not understand how they affect your overall portfolio. You'll discover why diversification in time frames, prices and strategies is a key to making money. This is simply fundamental to being a good investor. ThinkorSwim (TOS), in my opinion is the best broker and has the best trading platform available. If you had to pay separately for the kind of analysis tools they give you as an account holder it would cost you many hundreds of dollars a month in fees - with TOS they're free. I take you inside the TOS platform and help you access the power you have at your finger tips. Now that we have built our portfolio, how do we manage it by the numbers? We learned the greeks, so now it's time to put them into action. The key to success is knowing how to look at the numbers and know, without a doubt, what they mean and what to do with them if anything. This module includes 5 killer videos with real life examples as I manage a portfolio. What happens when our numbers don't look good? This is where 99% of all traders get killed in the market... they have no clue what to do when a position goes against them and they lose money. It's too bad because most trades can be saved to make a profit! Imagine making one small change to your position and increasing your odds of making a profit by 80%! That's what adjusting can do for you! In Trading As A Business, we KNOW what to do. We trade with confidence. We know and understand that when a trade goes against us it's an OPPORTUNITY to add to our portfolio by adjusting. I call it Smart Allocation of Capital. The art of adjustments is the missing link in trading options and stocks that almost no one teaches. How and when to close positions, and how to close them for maximum profits. The risks of holding positions into expiration week. When and how to 'buy' short-term insurance to protect your profits and increase your wealth in expiration week. How to close positions and get free trades left over that, although small, have a chance of DOUBLING our profits. 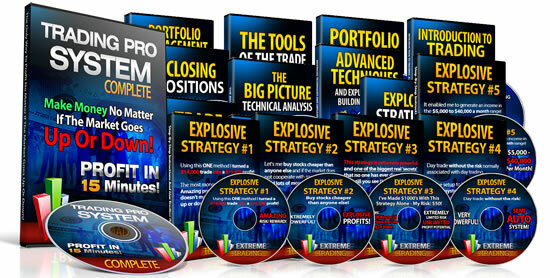 This module contains 5 videos, and the key theme here is MAXIMIZING our profits! What kinds of technical analysis help us in our business? There are only a few key analysis tools that can help you determine the probabilities of market direction and I tell you exactly what those are. I'll give you insights into why the market moves the way it does. I'll also give you a historical perspective on market movements going back to 1900 and give you a realistic plan of attack for determining future market direction based on factual evidence. In the 2nd video, I dive into short-term indicators that can sharpen your edge in the markets to better time your trades. Then I tell you about an indicator I stumbled on, that predicts short-term and opening market direction with an amazing degree of accuracy close to 95% of the time as well as how to determine intra-day movements and how to tell whether money is flowing into or out of stocks and what it means for intra-day price trends. This module contains well over 3 hours of solid teaching. Not even one of these strategies requires any knowledge of 'technical analysis' - it can help, but it's not required. These make money whether the market goes up or down. These are strategies you can manage based on 'the numbers'. One important thing I should mention: There are ways to make money that are NOT obvious. For example, Strategy #1 is something I have been studying for years, and it works every time and cannot fail to work. Using this one method I turned a $14,000 trade into a $75,000 profit in just 8 months. The most money at risk? Just $650. That was the total amount that was at risk when this position was initiated and NO more money was ever put into the position. Amazing profit/loss ratio. And it doesn't matter if the stock goes up or down but does require an longer time frame- 6 to 8 months. It is not uncommon for these trades to create the profits you can brag about. Want to make a killing in the market? It doesn't get ANY Better than this. This new strategy that has unlimited upside or downside potential and only $50 or so of risk! This strategy is extremely powerful and one of the biggest real 'secrets' that no one has ever discussed that I know of. Wait till you see the power of this strategy. I was able to make $1000's with this Strategy alone! It's extremely powerful. Think there's no free-lunch on Wall Street? This isn't one either but it's as close as it gets to one! This is the perfect strategy for playing earnings reports, takeover news stocks and any stock you think will move big in any direction with little risk. If you want to be more active in stocks but hate the risk, you'll love this. Day trade without the risk normally associated with day trading. Can be setup to be an 'semi-automated' trading system. Very powerful and again another low risk, high earning strategy for more active participants. This strategy includes 9 videos, and I take you through some real life trades in the course and show you exactly how I make thousands of dollars with these trades. I've also included 3 worksheets (Excel spreadsheets) for your convenience! If you liked the idea of the monthly income trades but were wondering how to 'turbo charge' them to make a fortune, then you will love THIS. Instead of $1000-$2000 a month you could start generating an income in the $5,000 to $40,000 a month range after learning this and with a lot less stress while trading as 'big' as you want. This last strategy is the 'icing' on the cake... the peak moment in all your hard study and will be worth 100 times what you paid for this course - maybe even more. Why didn't I reveal this until the very end of the course? Simple: You would not be able to use this strategy without a good foundation that was laid out in the earlier Modules. Everything we have learned thus far has been leading up to these explosive strategies. I've made this incredibly affordable so you can learn it without any serious financial stress. As I mentioned I have been to seminars for $3,000 and $5,000 and you will get much more from this course than both of those combined. I've also seen one trading course that charges $7,500 just for online access to learn the basics of options! So right there, you can see that the VALUE of this course is easily in the thousands. My Goal With This Strategy Alone: $1500 Per Day! In the Extreme Trading Video You'll See How I Day Trade The System, Using My Own Money. My Profit: $480 In Less Than One Hour! I'll Explain Exactly How The Strategy Works And How You Can EASILY Use It RIGHT AWAY! Plus... the "Price Action Control Panel"...I'll Show You Exaclty How To Set It Up! 2. The Inside Days System - An Extremely Reliable And Easy To Identify Trading Setup For Stocks And Forex. You'll Get Precise Trading Instructions On One Hour Of Video + a PDF Guide. There is no guess work involved, no need for emotions, and no difficult learning curve. All you have to do is follow the system guidelines and place your trades! A trading system for all experience levels! 149 Pages PDF - Incredible System! You're just seconds away from getting full access to the complete course. Order now and you'll be on your way to trading success! Okay, so now I've just added over $500.00 worth of bonuses onto the course. Considering that the course itself is easily worth thousands, and even the bonuses are worth over $500, I decided to price the course at $1000.00. I hope you will agree that it's a very fair and reasonable price for the entire package. However, I know that the economy has dealt a hard blow to many of the people who need this information the most. Therefore, I want to make it as easy as possible for you to become a member today. Instead of the normal price of $1000.00, I'm slashing the price like a crazed ninja! But this is a limited time offer. As I will explain below, I really need to limit the number of members I allow into the program, and if I sell it too cheap for too long, it will fill up too quickly and I'll be swamped with questions from new customers. That's not a misprint. I'm going to give you FULL access to this potentially life-changing program for only $97. There will be NO rebills! $97 is a one time payment for the complete course and bonuses! You don't have to get all the material. You will get the entire thing INSTANTLY when you order today. Also, I want to let you know that there is NO UPSELL. There is no "one time offer", or anything else that you just have to buy to complete the course. You are getting the FULL course. Corporate slavery... or crazy profits? Financial failure... or Trading freedom? Order Now - Get Instant Access To The COMPLETE SYSTEM, ALL MODULES, BONUSES For Only $987 $487 Only $97! $97 Special Offer Ends On, ! +EXTRA BONUS - DAILY TRAINING VIDEOS! The daily market reviews are very helpful to make sure you're on the right track and making the best trades each day. When you sign up for this exclusive bonus offer, you will receive 30 days of our Daily Market Advantage for only $9.95 (this is a $97 value). This is ESPECIALLY valuable considering the current volatility of the market. It will really give you an added boost of confidence to see my daily market analysis, and see exactly WHAT trades we are making. Basically you'll see everything I do in the markets day-by-day! You'll hear me 'think out loud' as I strategize positions and do some deep thinking about my portfolio and this business. Order Now and you'll be able to signup for this exclusive bonus offer in the member area! 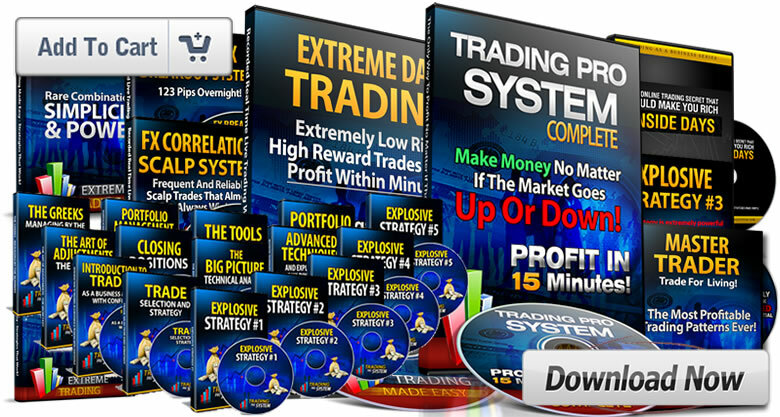 IMPORTANT: This service is optional and NOT Required for the Trading Pro System to Work! Disclaimer: This service is for educational purposes only and neither a solicitation nor an offer to Buy/Sell options, futures or securities. The Complete System/ Modules...Even if it's 3am! AT LEAST 90% WINNING TRADES or if you aren't satisfied for ANY other reason, simply let me know within 60 days and I'll refund 100% of your purchase. No questions asked! P.S. The Videos Include many Real Time Live Trading Examples with Precise Instructions Explaining The System and Strategies will make It Super Easy For You To INSTANTLY Understand And Use My System And Profit Right Away! P.P.S. The videos are grouped into several "Modules", with each Module containing 'hands-on' videos walking you through the entire system. Easy to Understand and STEP-BY-STEP!